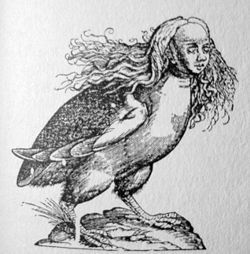 A medieval depiction of a Harpy as a bird-woman. Harpy is the singular form for the mythical creatures called Harpies in Greek mythology, winged-beasts that were sent down by Zeus to punish, most famously the prophet Phineus. They were sometimes referred to as "the hounds of Zeus" for such actions. Like many other second-tier Greek creatures, the Harpies were more prominent in art works than in mythological literature, and while they may occasionally be used in popular culture today, they are most widely remembered for their part in the legendary adventures of Jason and the Argonauts. Harpies are not seen as representing actual physical creatures, their characteristics—immortality and destructive cruelty—reflect attributes that we have not well understood in ourselves as human beings. The word Harpy in English comes from the Latin Harpyia, which in turn derives from the Greek Άρπυια, or Harpuia. Originally the word translated as "snatchers." However, in modern English, Harpy can also be defined as "whirlwinds." Harpies were often described as bird-like creatures, no smaller than an eagle but usually not much larger. They had the hooked claws and beaks of a bird, but also left an over-powering stench where ever they went. Later, the Harpies were depicted as having the head of a human being, similar to gorgons and sirens as composite creatures; they were usually described as female. They are often associated with the wind and air, and thus are sometimes seen as representing the duality of the air: calm and graceful at times, but also capable of great destruction and chaos. As the gods, and the wind, Harpies were considered immortal. As with many ancient Greek creatures, there is no widespread consensus on how the idea of the Harpy originated. It has been suggested that the Harpies were originally adapted from the ornaments on bronze cauldrons from Urartu. Other scholars point out that this theory is based upon the idea that the Harpies were bird monsters with human heads, which was not true in the original myths. Originally the Harpies were conceived as spirits of the wind, the personification of a nature occurrence that is frequent in ancient cultures. 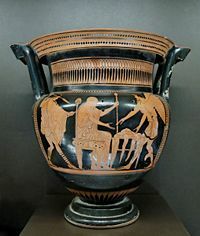 The sky was a significant place for the ancient Greeks, and much like the deeper parts of the ocean, it was revered because it was inaccessible. Mount Olympus, the realm of the gods, was located high in the sky and so the atmosphere and weather became associated as the whims of the gods. Therefore, it is conceivable that the idea of the Harpies could have come from the consistently shifting winds. It was not until later that the Harpies were given a physical form, for the sake of story telling. In their winged human form, the Harpies are no different from a large number of Greek divinities and as such would not need a special explanation for how they came to be. The later bird composite form is considered by most authors to have been confusion with an early depiction of the Sirens as bird women. The winged Boreads (left and right) rescuing Phineas (seated) from the Harpies. Side A from an Attic red-figure column-krater, ca. 460 B.C.E. A Harpy was the mother by the West Wind Zephyros of the horses of Achilles (Iliad xvi. 160). The Harpies were sisters of Iris, daughters of Typhon and Echidna, and were consistently viewed as those who carried out the punishments decreed by the Gods, granting their nick-names as "The Hounds of Zeus." Phineas, a king of Thrace, had the gift of prophesy. Zeus, angry that Phineas revealed too much, punished him by putting him on an island with a buffet of food which he could never eat. The Harpies always arrived and stole the food out of his hands right before he could satisfy his hunger, and befouled the remains. In this form they were agents of punishment who abducted people and tortured them on their way to Tartarus. They were vicious, cruel, and violent. They lived on Strophades. They were usually seen as the personifications of the destructive nature of wind. The Harpies in this tradition, now thought of as three sisters instead of the original two, were: Aello ("storm swift"), Celaeno ("the dark") — also known as Podarge ("fleet-foot") — and Ocypete ("the swift wing"). Aeneas also encountered the Harpies on the Strophades as they repeatedly made off with the feast the Trojans were setting. Celaeno cursed them, saying the Trojans would be so hungry they would eat their tables before they reached the end of their journey. The Trojans did not fare as well as the Greeks and soon fled in fear. Harpies were often peripheral creatures in artwork, showing up on pottery and in murals. More often than not, they were seen being driven away by the Boreads; sometimes they were depicted as horrific tormentors of those who angered the gods. During the European Renaissance, they were often sculpted, and were sometimes seen in hellish landscapes in association with demons and monstrous creatures. Harpies also became popular in heraldry. In the Middle Ages, the Harpy, often called the "virgin eagle," became a popular charge. Defined as a vulture with the head and breast of a woman, its reputation was one of bloodthirstiness. It became popular particularly in East Frisia, seen on, among others, the coats-of-arms of Reitburg, Liechtenstein, and the Cirksena family. The figures of Harpies, with their composite form and violent nature, are much employed in video games and other products of market-directed culture. ↑ "Harpy" Harpy Answers.com. Retrieved July 8, 2007. ↑ R. D. Barnett, "Ancient Oriental Influences on Archaic Greece." in Saul S. Weinberg (ed.) The Aegean and the Near East. (Locust Valley, NY: J.J. Augustin, 1956). ↑ Ostfriesland German Civic Heraldry. Retrieved July 8, 2007. ↑ The Last Unicorn (film) Retrieved July 12, 2007. This page was last modified on 10 May 2009, at 18:36.